McGregor Mountain Lodge is located on the slopes of McGregor Mountain along Fall River Road. This is near the Fall River Entrance to Rocky Mountain National Park, Colorado. It boasts spectacular views of the Continental Divide and the Fall River Valley. 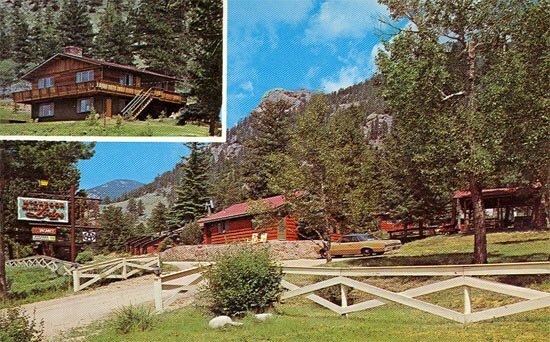 The Lodge property spans over 4 acres that back up to Rocky Mountain National Park. Elk and Mule Deer frequent the property, but we are also one of the best spots in the area to view Big Horn Sheep. McGregor’s sunny slopes provide a winter haven for numerous species of birds. We provide a paradise for wildlife watchers wanting to get away from it all. Granny lived in a house high on the mountainside for many years. She would collect the spring run-off water in jugs throughout the summer, using these stores to live off of during the winter months. She eventually had to sell off small parcels of her land to help finance her children’s college educations. In the early 1940’s Al Schiedler, an entrepreneur specializing in growing radio crystals, wanted to move his company from the Midwest to the Rocky Mountains. He begged “Granny” Kloss to sell him a large parcel of her land. She finally relented and sold Schiedler some land. He then went on to form a research facility for growing radio crystals. 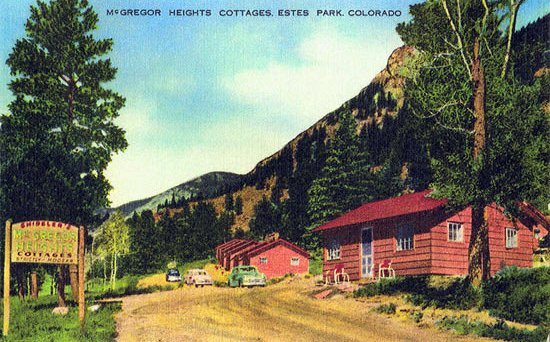 This research facility would later become McGregor Mountain Lodge. As many business owners in the area know, it is often difficult to find good employees that will stay on for the long term. It was no different for Al Schiedler in the 40’s and 50’s. He had trouble maintaining a top-notch research staff. One of his best researchers was hired by Dave Packard of Hewlett-Packard. This, coupled with the success of the transistor, led Schiedler to give up his radio crystal business. 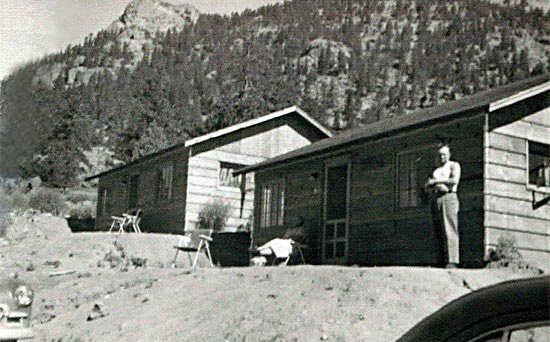 He transformed the research facility into a Rocky Mountain tourist destination, and the Lodge was born. Schiedler is responsible for constructing most of the cabins that still exist at the Lodge today. Many were simply transformed from research labs to cabins for guests. Al Schiedler ran the Lodge for about a decade until Quintin and Lucile Youngland, the current owners and operators of Wildwood Inn, purchased the property in the 1960’s. Being a general contractor, Youngland had great vision for development of the property. With the exception of the Chalet Building, it was his opinion that the development of the Lodge property had never been fully realized. While the Youngland’s maintained ownership of Wildwood Inn, they divided their property and sold what is now McGregor Mountain Lodge to a gentleman by the name of Schubert. Schubert was a water engineer and further developed the property by strategically placing well systems. Additionally, he constructed a small seasonal pond that helps to power irrigation systems throughout the property. Schubert later sold the lodge to Robert Elic, who held the property for a short time. He and his Swedish born wife, Marita, ran the property themselves. Elic took care of the maintenance while she kept the cabins neat and tidy for their guests. On May 7, 1981, the property was purchased by Warren and Ruth Clinton. Warren was a home builder and when he was away building homes across the country, Ruth ran the Lodge. After 22 years of hard work, which included rebuilding, remodeling, and providing tender loving care, Warren and Ruth sold the property to the current owners. The current Lodge owners are Michael Hodges and Chris Wood. They purchased the Lodge on June 20, 2003. Both Michael and Chris worked as property managers of McGregor Mountain Lodge before making their purchase.